Among the Vineyards Festival is the celebration of nature, wine, food, music and arts around the Jewish love Day of T’u Beav. The festival will take place at Marom Galile area of the Galilee on August 18-26, 2016. I visited some of the wineries, patisseries, hotels and galleries that will take part in the festival. Two of the wineries that will take part in the Among the Vineyards Festival are Adir Winery at Dalton industrial zone and Lueria Winery at Safsufa. Lueria also has a bed and breakfast called Miriam Estate. 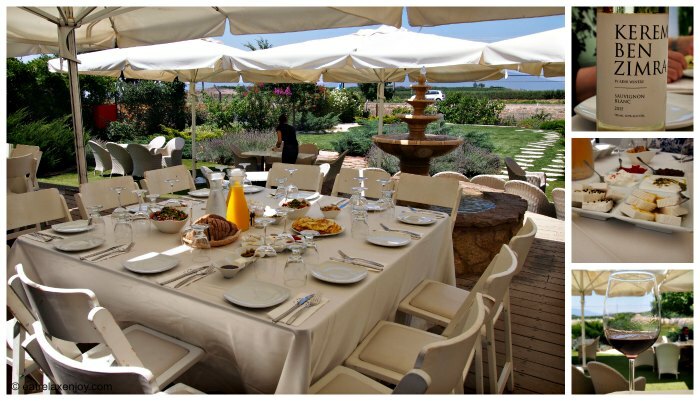 Another accommodation option is Amirey Hagalil boutique hotel that also has a restaurant open to the public. 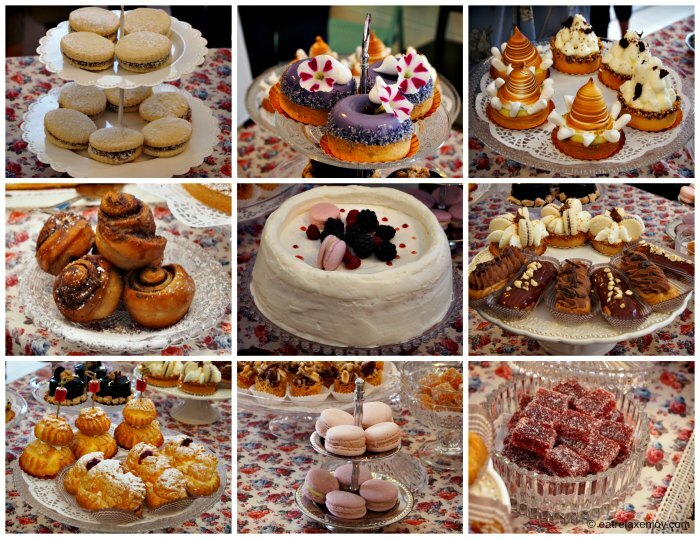 Two patisseries in the area are Madame Elkalai at Kerem Ben Zamra and Sharona at Safsufa. No festival is whole without some arts and crafts, Avi Goldberg opens his photography Gallery during the festival, and many other artists at Amirim village. Finally, there are many events and concerts as well, which I write about at the end of this article. Adir Winery visitor center offers wine from Adir Winery and Goat cheeses from “Halav Adir” (Adir milk). The visitor center has wine and cheese shops and activities such as watching a movie about the winery and the cheese farm, workshops, events, and light meals. In the photograph below are the wine (right) and cheese (left) stores. 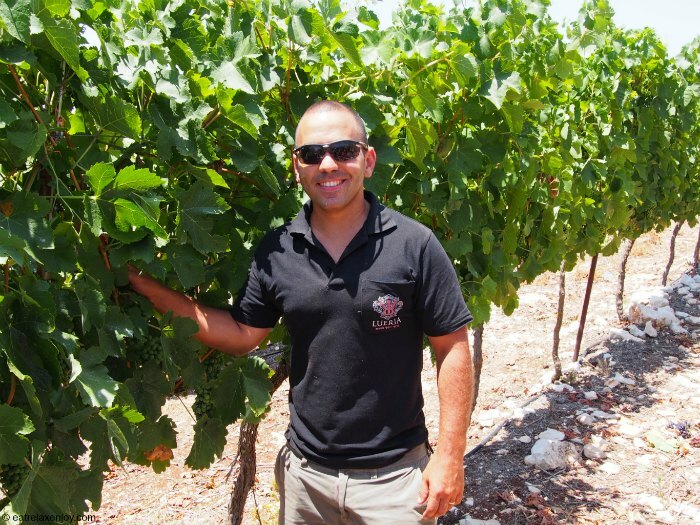 Adir winery was established in 2003 by two families living in the nearby Kerem Ben Zimra settlement. Since 1995, the families raise goats and the farm has 2,000 dairy goats now, and an active dairy. The dairy produces soft to medium-hard cheeses. They even make goat milk ice-cream! The elegant visitor center of Adir winery was opened in 2009. You can eat here breakfast, brunch and lunch, learn how to make goat cheeses, and learn about vineyards and wine making. Breakfast at the visitor center garden is a treat! The garden is very pleasant and calm and has great breeze. The meals are from local produce – bread that was baked on the spot, local jam, cheeses from Adir dairy farm, such as Feta and ‘Labane’, and the must taste goat butter! We at breakfast at Adir and tasted two wines – Sauvignon Blan 2015 and Plot 98. The Kerem Ben Zimra Sauvignon Blanc 2015 is a light and balanced wine that can go with any food, especially in the Israeli hot weather. Kerem Ben Zimra Plot 98 is a red wine similar to Port (but it is kosher so not exactly Port). I is a sweat wine with a heavy body. During the Among the Vineyards Festival, on 19.8, the Kerem Ben Zimra Sauvignon Blanc 2015 and another wine Kerem Ben Zimra A White, a blend of Chardonnay will be presented on a day of Latin music and wine tasting. 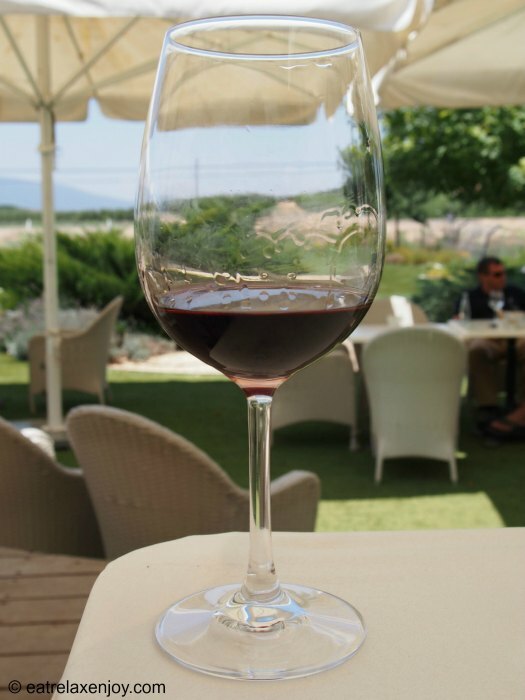 The entry price (of 50-60 NIS) will include a glass of wine and all you want wine tasting. Breakfast and Brunch will be offered, and live Latin music will be played all day long. The Winery is located at Dalton industrial zone. It is Kosher (Mehadrin). 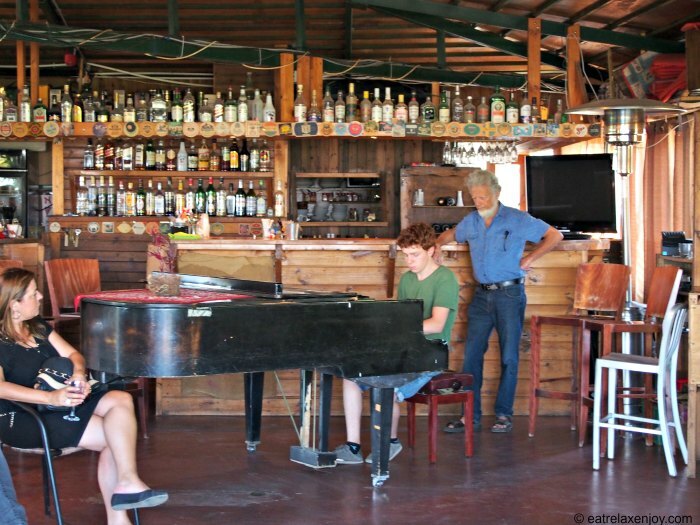 Lueria visitor’s center at Safsufa offers winery tours, wine tasting and wine workshops at the Winery and at the winery, and options for accommodation at the nearby Miriam Estate Bed and Breakfast. Lueria Vineyard is called Yosef Sayada’s Vineyard. It is located at an altitude of 840-890 meters on unique grounds especially suited for vines. The name Safsufa comes from “late maturing” because the fruits in the area mature late. For grapes, this means that they will be richer in tastes and less sweet, which makes it ideal for wine making. The vineyard spreads on 200 square meters and 11 types of grapes grow there. The best sections of the vineyard were chosen for the winery. Gidi Sayada took us to the Vineyard. Afterwards, we went to the winery for wine tasting. Lueria Gewürztraminer 2015 – a semi-dry wine made using ‘free run’ method of Gewürztraminer grapes from Yossef vineyard at altitude 840. The wine is suitable as aperitif or for dessert – sweet but with gentle balanced acidity with aroma of citrus and tropical fruits. Lueria Pinot Grigio 2015 – made using ‘free run’ method of Gewürztraminer grapes from Yossef vineyard at altitude 840. 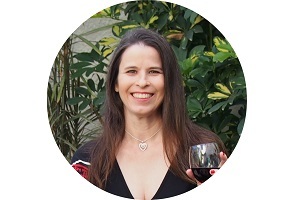 This wine is new in Israel and it is its second vintage. The wine has a medium body an aroma of guava and passion fruit and is European in style. Lueria Cabernet Sauvignon 2015 – made of 100% single vineyard Cabernet Sauvignon grapes from Yosef Sayada vineyard. Aged 12 months in French oak barrels and is not filtered. The wine has a nice colour, heavy body and rich and complex taste. Lueria Grand Vital 2013 – this is the special wine of the vinery. It is a blend based on Cabernet Sauvignon and its other parts are changing from one vintage to another. It is an award winning wine. It is made of the best sections of the vineyard. The wine is aged 24 months in French oak barrels and is not filtered. It has a very heavy body and rich and elegant taste. Before we left the winery, we stopped and peeked at the Miriam Estate bed and breakfast. The place has fancy wooden bungalows with large Jacuzzi and an attack for the children. The center of the complex there is a swimming pool with a garden. 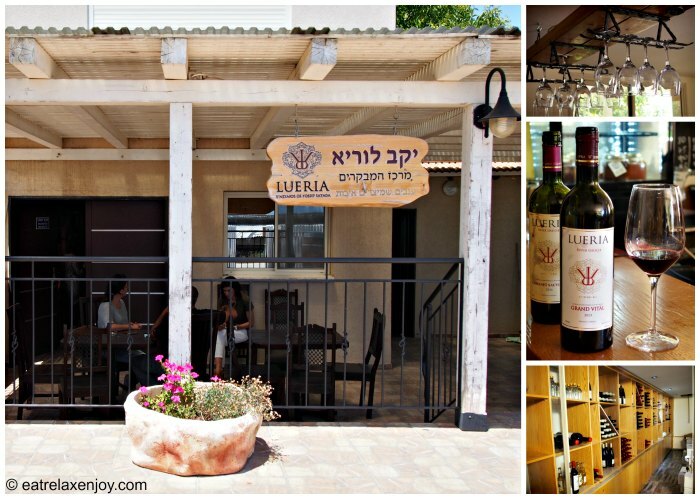 Lueria’s wines are Kosher Mehadrin. Amirey HaGalil is a boutique hotel on a hillside at the entrance to Amirim village. It is an intimate hotel with 16 rooms. 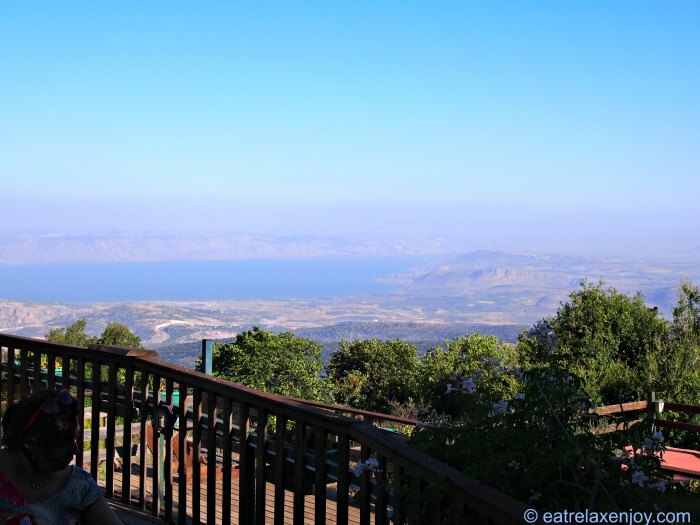 The hotel is immersed in vegetation and overlooks the Galilee Mountains. It offers a relaxed atmosphere, a spa, and a free entry to the nearby Amirim swimming pool. 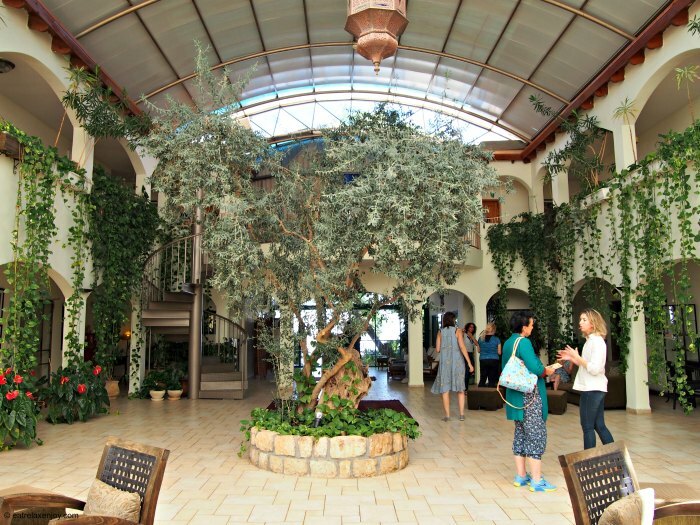 The lobby of the hotel is like a greenhouse, full of light and natural vegetation, it looks like a Middle Eastern khan. 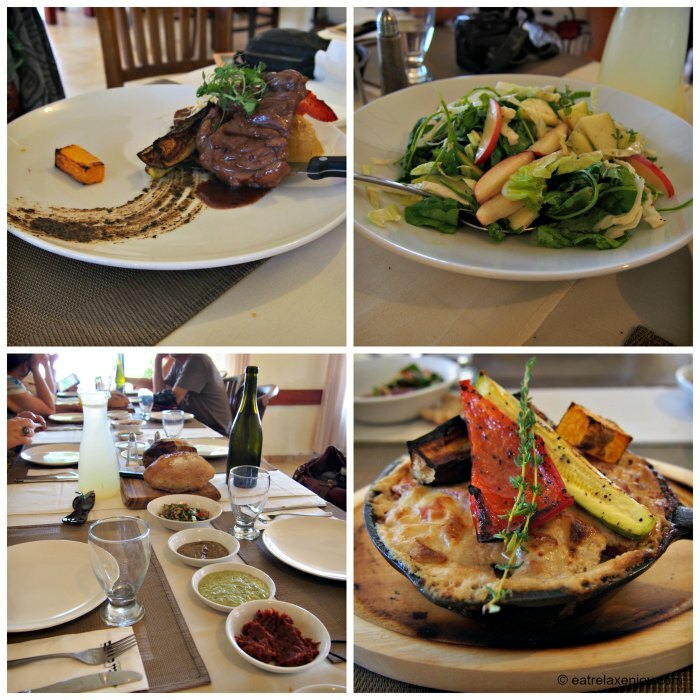 We had lunch at the hotel’s restaurant “Bein Kramim” (Among the Vineyards), with starters, salad and local entrees such as chicken steak and ‘Siniya’ which is a dish of ground beef and lamb with Tahini sauce (right hand side of the photograph below). During the festival, on 21.8 a special dining and wine tasting event will be offered; for details call: 04-6989815. The following patisseries will be open during the festival (closed on Saturday). 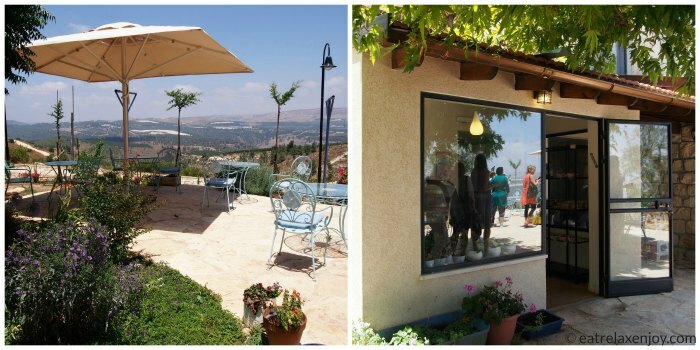 At Kerem Ben Zamra, in an old typical Galilee style house, in front of the open view of the Galilee Mountains, resides the patisserie and coffee shop Madame Elkalai. They serve here light meals and what Bar, the granddaughter of Madame Elkalai makes at the patisserie. The patisserie is open during weekdays, and the coffee shop on weekends. We tasted an excellent lemon cake that Bar makes. She also makes cookies, cakes and other sweets (such as Macaroons). Sharona Patissrie is a must visit for the sweet lovers. 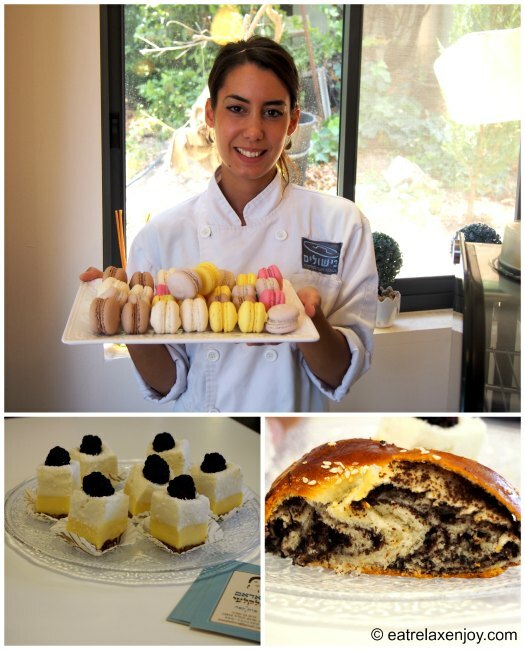 Sharona and her team prepare all sorts of sweets and cakes that can compete with almost any French patisserie. They make here mousse cakes, yeast dough cakes, fruit pies, macaroons, éclairs, fresh pate de fruit, cookies and much more. Whatever I tasted here (and it was a variety) – was excellent! The macaroons were perfect – crunch and not sticky – just like in Paris. The mousse cakes were light and soft, the yeast cakes were rich and soft and the fruit pie with almond meringue was so good – to die for! If you think about something sweet when you are around – go there! Sharona Patisserie is located inside Safsufa, it is Kosher Mehadrin (dairy and parve) and is open during the weekdays. You can sit there for light meals, for coffee, and buy whole cakes as well. The Galilee always attracted artists. 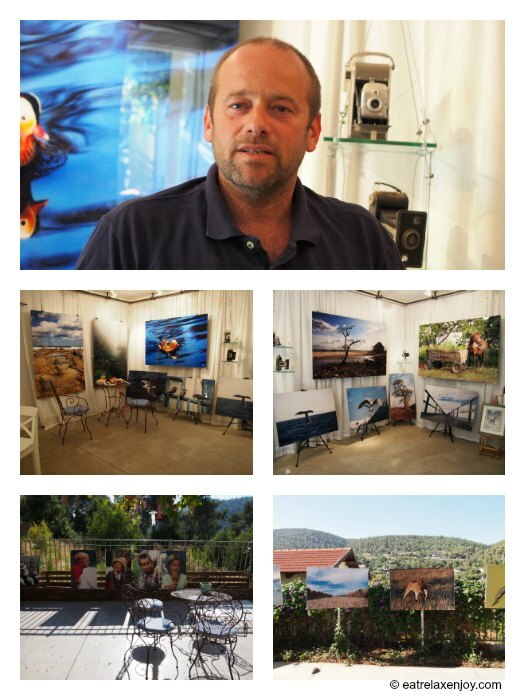 Avi Goldberg moved to Shefer from Petach Tikva (near Tel Aviv) to open here his gallery. Avi took around 100,000 photographs during 11 years in all continents. Many of his photographs are nature photographs but he also has portraits. He also wrote two books. A visit to his gallery is very interesting, and can be coordinated directly with him at 052-4411234. During the festival, free guided tours of the gallery will take place daily at 20:30 (except Friday 19.8 at 17:00, and Saturday 20.8 at 21:00). 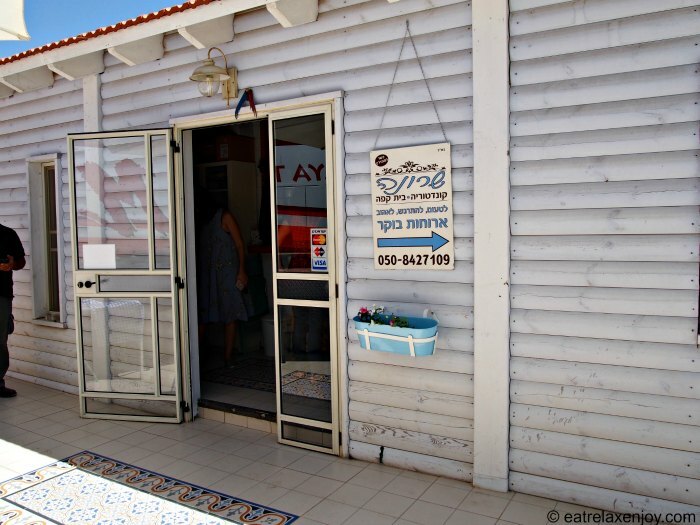 If you are interested in more arts and crafts, there are many galleries at the village of Amirim. More information about it can be found in my post about the Wine Path Festival of 2015. Hemdat Yamim is a settlement at an altitude of 800 meters on the top of the mountain above Shefer. The little settlement, with only 5 families, owns a club for live events and concerts. The club has a set of balconies overlooking the magnificent view of the area and the Sea of Galilee! When visibility is good, one can see from here both the Mediterranean Sea and the Sea of Galilee. If you are in the area, it is worthwhile checking if there are concerts here – for the music and for the view! 18.8 A concert: Shlomi Shabbat and Rita at Ein Hozim. 19.8 Oasis music (from 14:00) at Hazon.